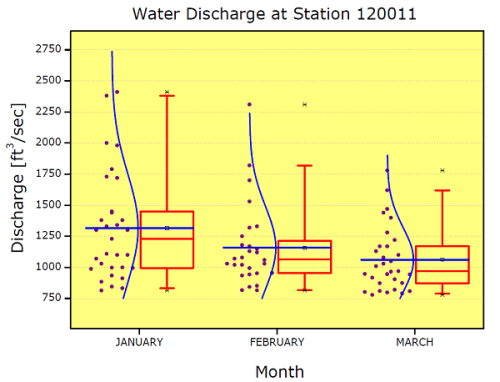 This graph displays box plots created from data for water discharge for three months. Each box includes the maximuim, minimum, mean, 1st and 99th percentile marked on the graph, in addition to the 25th, median, and 75th percentiles. The raw data is included int he graph as a column scatter plot to the left of each box. A curve corresponding to normal distribution is also displayed on top of the scatter plot. A check box is also available to enable display of Mean Line in the plot.